Donald Trump's modeling agency has profited from the very same visa program that the presidential candidate himself has slammed -- and appears to have violated federal law in the process, a CNNMoney investigation has found. Throughout his campaign, Trump has loudly opposed the practice of U.S. companies using foreign workers instead of Americans -- specifically the highly-skilled workers brought to the United States through the controversial H-1B visa program. "These are temporary foreign workers, imported from abroad, for the explicit purpose of substituting for American workers at lower pay. I remain totally committed to eliminating rampant, widespread H-1B abuse," Trump said in a statement on his website, though he backtracked on his position during a recent Republican debate. And now, the use of this visa by Trump Model Management, founded by Trump in 1999, is being questioned. The agency is currently battling a proposed class action lawsuit filed by Jamaican model Alexia Palmer, who was brought to the country with an H-1B visa. The suit alleges that the agency recruits foreign models with promises of wages that never materialize and defrauds the U.S. government on visa applications. Palmer is currently the only plaintiff and the suit has not yet been approved as a class-action. In her case, Palmer says she was paid only a few thousand dollars over three years despite being lured with the promise of more than $200,000 in earnings in that same time period. That salary was also what was listed by Trump Model Management as part of the visa application. "Ms. Palmer will receive compensation of at least $75,000 per year," the agency's president Corinne Nicolas said in a letter to immigration officials. "She is a model whose services have been in great demand, and whose proposed temporary presence in the United States has stirred great anticipation by Trump Model Management and its clientele." (Nicolas did not respond to a request for comment). Trump Model Management's application for Palmer's H-1B visa. Government data analyzed by Howard University professor Ron Hira shows that since 2008, Trump's agency has successfully brought over around 30 foreign models -- from countries like Brazil, Latvia and China -- using the H-1B program. Almost half of these applications indicated the same $75,000 annual salary, while others went as high as $416,000. CNNMoney asked a dozen attorneys and other immigration experts to review facts and documents from the case, and the vast majority said Trump's agency appears to have violated immigration law. "It seems pretty clear to me that there was a violation... and a pretty egregious violation," said New York immigration attorney Jeffrey Feinbloom. Experts say that the U.S. government requires that full-time H-1B workers like Palmer be paid a high enough wage that they aren't being exploited or displacing American workers -- regardless of how much they end up working. 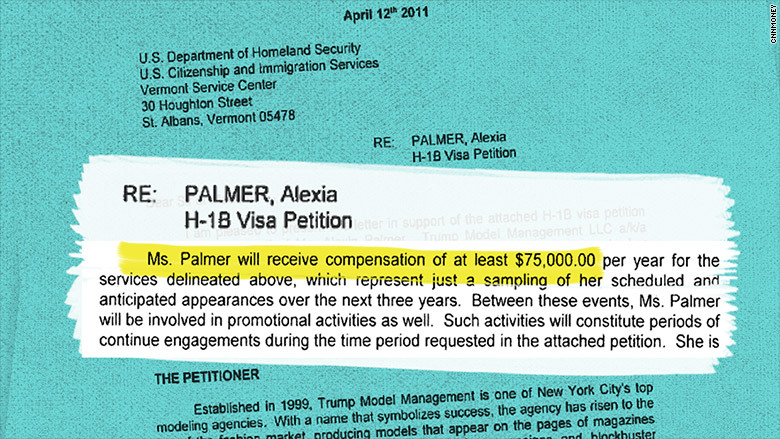 Experts say that the firm was required by law to pay the amount stated on Palmer's visa -- in this case, $75,000 a year. Even more egregious, they say, was that the Trump agency didn't pay the "prevailing wage" determined by the U.S. government (which is based on the industry and location). The U.S. Citizenship and Immigration Services agency (USCIS) confirmed that a sponsoring company "must pay the actual wage or the prevailing wage, whichever is higher" -- meaning it was illegal to pay Palmer below either listed wage. "Employers may never pay below the prevailing wage," the agency said in a statement. For Palmer, the prevailing wage acknowledged by the Trump agency on the visa application was roughly $45,000 a year. Instead, she made less than $30,000 over three years from modeling jobs for clients ranging from Conde Nast to Saks Fifth Avenue. And she didn't even get to keep that full amount. It was almost entirely eaten up by taxes, a 20% commission to the Trump agency, administrative fees and modeling-related costs like $75 walking lessons and a $200 dermatology visit. In the end, Palmer netted $4,985 over three years (which included cash advances and a $3,880.75 check), a figure acknowledged by the Trump agency. Model Alexia Palmer says Trump Model Management paid her only a few thousand dollars over three years. It's unclear whether the U.S. government would look at the earnings she received before or after deductions like commissions and modeling expenses. But either way, experts say she earned far less than the amount required by law. "If someone isn't being paid what they are supposed to be paid, they are being exploited," said Neil Ruiz, executive director of the Center for Law, Economics and Finance at George Washington University and a national expert on H-1B visas. "This case shows that [Trump's] own company has benefited from exploiting his own H-1B visa holders." CNNMoney was unable to reach Palmer, but her attorney said it was a "no-brainer" that his client's rights had been violated. But the Trump agency said the 20% commission and reimbursements were clearly outlined in the contracts Palmer signed. "It is important to note that at no time while TMM was her model manager did Ms. Palmer EVER object to any of these deductions from her gross pay," Lawrence Rosen, the attorney representing the Trump agency, told CNNMoney. Rosen said that Palmer was paid for the jobs she booked and nothing more -- a practice that he described as standard throughout the modeling industry as a whole. The Trump campaign had a similar argument. "In regards to Ms. Palmer, this is standard practice in the modeling industry and the visa application form is inadequate to address the practice of the industry," a Trump spokesperson said in an email. Attorney Michael Wildes, whose law firm handled Palmer's visa application on behalf of Trump's agency, said that the H-1B visa gave Palmer the best chance of getting to the United States. He argued that it's not the agency's fault that U.S. immigration laws "are archaic." "Mr. Trump and his modeling agency decided they wanted to give this lady an opportunity to work," he said. "There is a disconnect in the world of agency law and immigration law." And Trump agency attorney Rosen argues that since the agency was hired by Palmer, she was never considered an employee of the firm, and thus has no claims for a certain wage. "She just didn't have a very successful modeling career," said Rosen. However, the U.S. Citizenship and Immigration Services agency was clear that the pay requirement applies to "an employer or an agent." Still, Rosen acknowledged that the agency should have been more clear in the initial visa application. He said that the $75,000 salary listed on official visa documents, which are filed under penalty of perjury, was nothing more than a "guesstimate." "In hindsight, now that he's running for president and all that, you look at it and say why doesn't it say 'estimate'? Well maybe it should have," he said. But immigration attorneys say that there is no such thing as a guesstimate when filing this kind of a federal visa application. "For them to promise the U.S. government to pay this employee this particular wage and not do it, it is a violation," said Virginia immigration attorney Hassan Ahmad. "It depresses wages. It is the underbelly of the industry." But even if it is determined that her wages were in violation of immigration laws, Rosen argued that the civil case has no merit because it's up to the Department of Labor to investigate a violation -- not the civil court system. CNNMoney asked the Department of Labor and the USCIS to weigh in, but neither would comment on the case specifically. Palmer's civil case has been pending since last year, awaiting a judge's decision on whether it should be thrown out (as requested by the Trump agency). A clerk for the judge said a ruling is expected by the end of the month. Whether or not it ends up being dismissed, many attorneys say Palmer would have a chance if she turned to the U.S. government instead. They also wonder just how far the alleged abuses go. "The real question," said New York immigration attorney Steve Maggi, "is if Trump does this in this case, how systematic is it?"